Designer, why conform your designs to a vendor spec, when BCE will adapt to yours? Sixty years of high-tech design experience in OEM semiconductor equipment, OEM medical equipment and R&D yields one of BCE's most innovative products. Learn what a vacuum feedthrough is here. Optimizing imaging for deep space applications. Threaded connections engineered for your application. 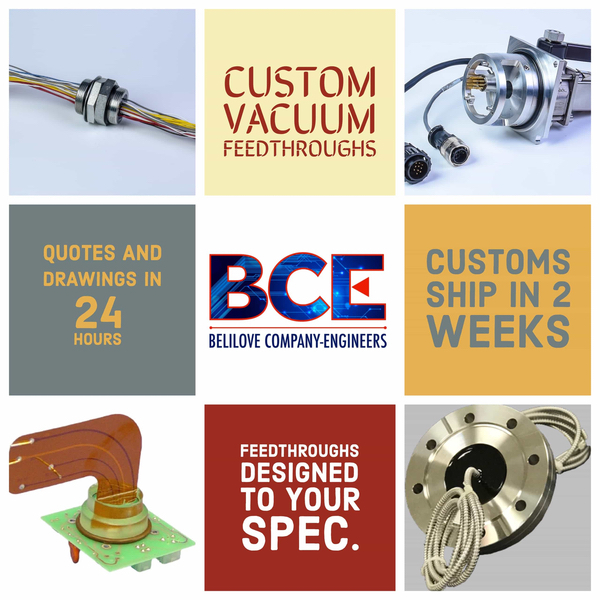 Custom high current vacuum feedthroughs. Flanged connections engineered for your application. The advantages of printed circuit board mounted epoxy feedthroughs are "clear". The best choice in application flexibility, cost, and high performance. Take it all through the wall with PCB mounted feedthroughs. Take it all through the wall with fiber optic cable feedthroughs. Take all your liquids and gases through the wall with multi tube feedthroughs. Take it all your serial comms through the wall with D Sub feedthroughs. Take it all through the wall with custom bracket feedthroughs. Take all your liquids and gases through the wall with single tube feedthroughs. Easy and convenient connections through the wall with 120V socket feedthroughs. When space is at a premium. One feedthrough for multiple collection of temperatures. Breaking barriers in high vacuum applications. Cost effective, brass body construction. Easy to replace, multiple thermocouple feedthrough. High temperature, High vacuum, dual thermocouple feedthrough.